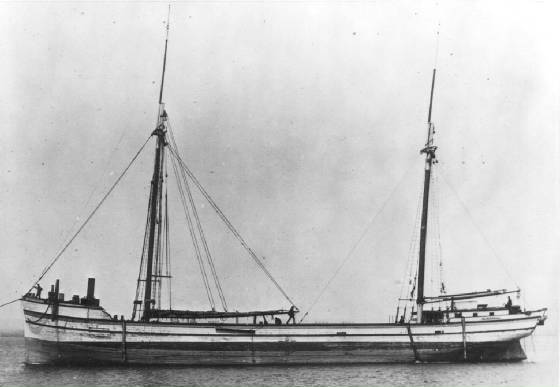 Mary Gowman, the cook on the schooner-barge Harvey Bissel was found dead of a ball shot to the chest while the vessel was on Lake Michigan, off Sturgeon Bay, Wisconsin, on May 10, 1882. When the boat arrived that night at Sturgeon Bay, the captain, a man identified only by the last name of Brock, contacted local authorities and an official investigation was made. It was a stormy night, the local coroner could not be located, so the justice-of-the-peace summoned a group of six citizens to serve as a jury. The jurors then took a small boat out in the storm and made their way to the schooner, which was anchored off shore. After questioning the captain, and the first and second mates, the jury, which included a local physician identified as Dr. Muellin, the group reached a conclusion that Gowman's death was a suicide. No reason for the conclusion was published. A few days later, a letter by an unidentified "gentleman" in Sturgeon Bay appeared in the Chicago Inter Ocean that raised some serious questions about the incident. The letter pointed out that Mary Gowman was a "fine-looking" 25-year-old woman from the Cleveland area who had reportedly received papers from her husband that he was filing for a divorce on grounds of infidelity. The writer questioned the "superficiality" of the investigation without a coroner and with only one doctor present. "The men who conducted the inquest had with them a physician, who in probing the wound to find the ball, did not succeed in reaching the ball, but announced that it had taken a direction downward, and from the left side toward the right, making it apparent that if Mrs. Gowan fired the revolver herself she was a left-handed person." He questioned if anybody determined if she was left handed. The letter writer also said that "the many who saw the wound assert that it would have been impossible for her to have fired the revolver herself with either hand" because the ball entered the body high in the chest. There was yet another oddity about the body. The letter said: "The condition of the rings on Mrs. Gowan's hand seem to indicate that there may have been some rough handling of her before her death." It said one ring was broken completely in two and the other was bend in against the finger so that it was difficult to remove it. "Is it not to be supposed that she wore it right along in that condition, for it would have occasioned pain to the finger," he wrote. Another anonymous source story appeared in the Chicago Inter Ocean the day after the letter appeared. It suggested that Mary Gowan was despondent. The story said the writer talked to a friend of Mary Gowman, who said Gowan had attempted suicide a few months earlier. The writer said he believed that Captain Brock was blameless in the matter. No other news stories about the case could be found and it appears that the Sturgeon Bay authorities did not conduct a murder investigation. The question that went unasked was whether Mrs. Gowan was, indeed, unfaithful to her Cleveland husband, and what she was doing on the Bissel. Not only did she have a husband at home, but an eight-year-old son. Was she having an affair with one of the members of the Bissel's crew? Was Mrs. Gowan murdered that night and did the three officers conspire to cover up the deed? Mary Gowan's body was taken ashore on May 12 at Sturgeon Bay where she was given a pauper's burial at the county's expense in Bayside Cemetery.